When the Rourken Dwemer migrated west to Hammerfell, they found a land rich in untapped mineral wealth. They roamed far from their city of Volenfell in pursuit of it, bulding deep mines and busy workshops. Many of these sites remain virtually untouched. 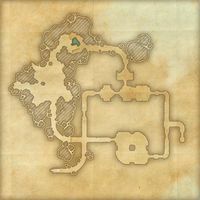 Santaki is a Dwemer ruin in the western Alik'r Desert, south of Sentinel containing bandits.